Hey everyone - hope you can all stop by for any part of this great event. We'll be there from noon to midnight, and the sound will be continuously evolving, so pop in when you can! And if you're really adventuresome, why not stay for the whole thing and experience something very rare in live music!! Capping off a compelling first year of performances that ranged from the intensely quiet Berlin sound master Andrea Neumann to the roaring noise of Sonic Youth's Thurston Moore, with many stops in between, the Albany Sonic Arts Collective (ASAC) is proud to present our first anniversary celebration at the Upstate Artists Guild. For this very special event, several ASAC sound and video artists will be collaborating live to create an immersive sonic and visual environment. The "drone" is a part of life, from the constant hum of electricity to the constant rush of traffic around us. Music from all parts of the globe has drawn inspiration from the sounds found in drones. In celebration of the universal harmonic power of drones, the ASAC musicians will conjure a continuous river of sound, building on sustained tones and repetition. 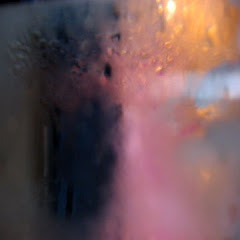 Inspired by LaMonte Young's Theatre of Eternal Music and Dream House installation, along with the music of Charlemagne Palestine, Phill Niblock, and others, the goal is to develop a musical vehicle for immersion, reflection, deep listening, meditation, and concentration. Video projections throughout the gallery will accompany the ongoing music. Attendees are encouraged to bring pillows, chairs, and snacks, and to stay for as little or as long as they would like. Unlike a traditional performance, performers will be located throughout the gallery, and may move during the performance in order to explore subtle acoustic phenomena. Attendees are also encouraged to walk around, enjoy the art on the walls, watch the video projections, and discover new relationships to the sound in the drone. The collectively summoned drone will be harmonically rich and full of mysteries for the listener to discover. By presenting a 12 hour continuous performance, the music will unfold and develop in an evolutionary way unlike any ordinary concert. Parts of the drone will be quiet, others will be loud; parts will be relatively still, while others will be dynamic. Such diversity mirrors the range of sound we experience in the world every day. 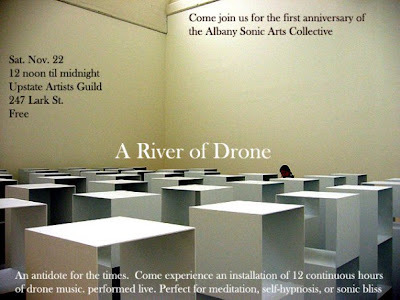 We hope you will join us to meditate, listen, self-hypnotize, bliss out, or simply enjoy a swim in the RIVER OF DRONE! This was great. I was not able to stay for a very long time but what I did get to hear was amazing. Happy first birthday ASAC - and here is wishing you another great year. I was there from 9 PM to midnight and it was amazing. Keep up the great work ASAC, UAG etc.